Home announcements Application Applications iOS 6 launch Problems Web Applications Google Maps Street View Back In iOS 6! Google Maps Street View Back In iOS 6! As we’ve reported, iOS 6 has ditched off several Google’s services, including Google Maps. However, the native Maps present in the latest iOS version has not met up with the customer expectations, with Tim Cook apologizing publicly “for the frustration this has caused Apple customers” and promised to do everything that is possible to make Maps in iOS better. Apple CEO even suggested trying alternatives by downloading map apps from the App Store like Bing, MapQuest and Waze, or use Google or Nokia maps by going to their websites and creating an icon on the home screen to their web apps, till Cupertino Company brings lives up to the same incredibly high standard. On the other hand, Google has just started integrating its Street View data into the web app version of Google Maps - this is for bringing the feature back to iOS 6 users. The rollout has begun today and yet appears to be limited to certain locations. However, most areas in U.S. and Canada are now covered and it’s expected that the globe that Street View will soon be live in majority of supported areas. 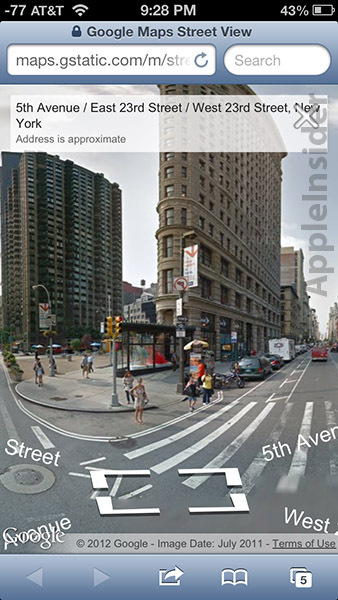 Street View web app brings interactive 360-degree street-level photographs back to iOS 6 users, but the search giant has not yet fully integrated the service into its iOS-compatible web app, as several locations supported by the complete variant developed for desktop browsers aren't yet accessible in the mobile version. As the rollout has just started, the service is not 100% stable, while panning and scrolling operations are fairly smooth. However, the option to zoom in on an object and the image is not working properly. Anyway, the service still provides high image quality and the intuitive controls, enabling users to get a first-person look at your surroundings by simply tapping on a person-shaped icon at the bottom of the screen while searching for a certain location in Safari.